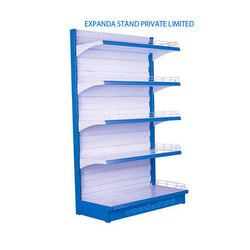 Leading Manufacturer of supermarket wall racks from Chennai. Manufacturer and Exporter of Wall Racks, which also termed as ‘Wall units’, ‘L-type racks’, ‘Wall side racks’, ‘Single side racks’. Expand stand’s wall racks are a stand-alone design which also supports add-on modules. The corrugated metal back panel used in our shelving system enhances the strength and durability.